In celebration of its 107th year, the Central Florida Fair will once again roll its way into Orlando for 13 days and 14 nights of entertaining thrills and delicious treats. The fair begins on Thursday, February 28 and runs until Sunday, March 17, but will be closed on Mondays and Tuesdays. In addition to rides, food, and music, the fair will feature a variety of exhibits from Central Florida’s best and brightest students. Located at 4603 West Colonial Drive in Orlando, the fairgrounds will host the biggest midway in Central Florida. 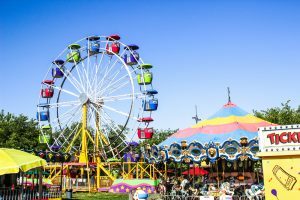 The midway will include many crowd-favorite rides from years past as well as food vendors serving classic fair treats such as cotton candy, popcorn, and funnel cakes. Each week, the fair will feature free concerts included with admission as well as paid concerts from some of today’s hottest musical acts. A full lineup of scheduled artists will be available as the event nears. While regular gate admission to the Central Florida Fair costs $12, adults can purchase advance tickets on the fair’s website for $8. Parents can also save $2 on advance tickets for children between the ages of 6 and 11. Children age 5 and under can enjoy the fair for free. Gate admission does not include a ride wristband. However, the fair is offering a discounted megapass ticket online for $25 that includes admission and a wristband valid for one day of unlimited midway rides. A family four pack megapass is also available at centralfloridafair.com for $95 — a savings of $68. The Central Florida Fair celebrates the community by showcasing youth art, agriculture, horticulture, and livestock exhibits from middle and high schoolers within Orange, Seminole, Brevard, Lake, Osceola, and Volusia counties. Landscape Design Competition – Sponsored by the fair’s Creative Arts and Food Arts program, the competition is open to local FFA Chapters and 4-H Clubs. Landscapes that depict initial planting will be designed with materials selected from an on-site nursery. While each design will be featured in the fair’s horticulture exhibit, select winners will be awarded $300 for first place, $200 for second, and $100 for third. Livestock Competitions – In multiple events, local youth will have the opportunity to showcase their steer, cattle, swine, sheep, lamb, poultry, rabbit, cavy, and goat breeds. “Rock Your Stock” Youth Expo – In this event, Central Florida youth will exhibit their best cattle, goats, and sheep in an exciting showmanship contest. If you plan on attending the Central Florida Fair as either a spectator or exhibitor, reserve your room at Clarion Inn Lake Buena Vista. For comfort at an affordable price, our newly-renovated hotel is the perfect place to stay while enjoying the fair or any of Orlando’s other wonderful attractions. Call us today at 407-996-7236 to book your stay.